The U.S. diplomatic post in Benghazi, Libya, was operating under a lower security standard than a typical consulate when it was attacked this month, according to State Department officials. The mission was a rented villa and considered a temporary facility by the agency, which allowed a waiver that permitted fewer guards and security measures than a standard embassy or consulate, according to the officials. There was talk about constructing a permanent facility, which would require a building that met U.S. security and legal standards, the officials said. Allowing a waiver would have been a decision made with input from Washington, Libyan officials and the ambassador, according to diplomatic security experts. "Someone made the decision that the mission in Benghazi was so critical that they waived the standard security requirements, which presents unique challenges to the diplomatic security service as you can imagine," said Fred Burton, vice president for Intelligence at STRATFOR, an intelligence analysis group. While standards were lower at the compound, security had been enhanced at the post after a number of incidents this year that included a failed bombing attempt against the compound in June, according to sources. Several security changes were made over the past few months, the officials said. These included additional barriers and barbed wire, increased lighting, chain link fences, additional sand bags and closed circuit television. Every U.S. building on the compound was also fitted with a safe room with a steel door, although the officials recognize that the room was not fireproof. Ambassador Christopher Stevens and the other Americans killed in the attack are believed to have died of asphyxiation from heavy smoke. "We took the place and made improvements to it in a continued fashion," one official said, adding that a pre-September 11 review of base security deemed the post to be adequately secured given the threat. The threat assessment was based in part on the June attack and previous attacks on other foreign targets, which included the attempted kidnapping of a Red Crescent staff member, a bomb attack on a United Nations convoy, a rocket attack on an International Committee of the Red Cross facility, and a similar attack on the British ambassador's convoy. The protections in place reflected the State Department's understanding of the threat, which did not suggest a swarming attack by a militia, the officials said. U.S. officials have said the attack was a spontaneous outgrowth of a protest over an anti-Muslim film. Officials told CNN's Security Clearance last week there were questions about whether there was a significant protest ahead of time. There was no indication anything was amiss a couple of hours before before the attack was believed to have started, according to one American who was in Benghazi. The American, who spoke to CNN on Monday on the condition his name not be used, said he had been speaking with Stevens less than three hours before the deadly attack. He said there was no indication during the conversation that anything was wrong, saying Stevens sounded upbeat and calm and he was very enthusiastic about the next day's meeting with the American. About 20 minutes after that conversation, the American spoke with a U.S. security officer to discuss logistics about the upcoming meeting. That call also revealed no signs of any pending trouble, he said. The American had a second call with the security officer a little more than an hour later, around 9:30 p.m. local time, and the situation had dramatically changed. The security officer told the American "we've got a real problem here" and hung up. The timing matches what CNN's Arwa Damon, who has been reporting from Benghazi, said about the September 11 attack. Damon reported a group of armed individuals showed up outside the consulate around 9:30 and a firefight broke out within 30 minutes. The American source was at his hotel, located a little more than a mile from the diplomatic post, when he heard large explosions coming from the direction of the mission seconds after the phone call. And a DC-3 - an antique aircraft - would have accomplished what, exactly, against folks armed with RPGs? How would that have, in any way, improved security for the Libyan embassy? Use your heads, folks! This is worse than incompetence! What is anyone supposed to think? Who asked for and who granted this waiver? When, exactly, did that happen? The senators who asked for cables from Stevenson said, ""Despite these warnings, the State Department sought and received a waiver from the standard security requirements for the consulate," making it sound like the standard wasn't lowered until just before the attack. What if a new Marshall Plan were organize to redesign and rebuild big cities of the Middle East? New bond issues could be voted on to help pay for this. Oil revenues and minerals income could pay back these new bond issues. There is an unemployment rate of 25 percent. This may be contributing to the unrest in these cities. You could hire the youth of these cities to rebuild their towns paid for with these new bonds. As part of the redesign of these Middle Eastern cities, you could add layers of new walls with checkpoints and close some roads surrounding our embassies. Thus make them more safe. I believe we should look into forming new bond issues into redesigning and rebuilding those Middle Eastern cities. You could solve a few problems (mentioned above) at once. Is this a joke? The Marshall plan was designed to rebuild bombed out cities and ruined economies post WW II. And you suggest we should do the same here? How could you ever think this is a similar situation? Do you honestly believe that throwing infrastructure $$$ at the region will improve anything? Clearly lack of money and infrastructural improvements are the basis for the entire regions discontent. Maybe we should also air drop Playstations 3s so that every child can understand how much more fun it is to kill over a high speed internet connection rather than real life! Problem solved, nothing to see here. "The U.S. diplomatic post in Benghazi, Libya, was operating under a lower security standard than a typical consulate when it was attacked this month, according to State Department officials." No sh-t. Now lets crawl before the UN and apologize some more. 5 security guards there for 1 person. everyone else was out of the building already. He was choked to death, hence the blue lips in the photos. Grampasez posted: "CNN jumps in to PROTECT OBAMA'S dereliction of duty, making up for its earlier revealing of information about Steven's personal concerns." So the Affirmative Action president is too busy with Beyonce and JayZ to pay attention to his presidential duties. Good post, I guess the buck stops anywhere except with Obozo. We know that you are racist as always you call Obama obozo, I'm wondering what education level you have even it's clear from your comments that your education level can't be even good to be hired as a toilet cleanner, you have to thank God that you still around Rednecks give you some connection to get a job without High School diploma, and by the way even obozo is good nickname than Redneck! Whom ever Mike is that was berating M123, should really proof read his posts prior to speaking about another persons education level. Based on the grammar he used I would say Mike is functioning at about a 7th grade level. Might have completed more school but it obviously wasn't retained. I can't understand how these failures occur. How can security be at a low level on, of all dates, Sept. 11th? How can any outpost of the US be seized and our citizen killed with out one fatality on the side of the aggressor? To many questions and to many lies attempting to cover it all up. So Mike, what leads you to believe m123 is a redneck? He uses better grammar than you. I happen to be from a small southern town where we like trucks, tractors, and guns. Does that make me a redneck? I have a college education. Do you? It doesn't sound like it. CNN jumps in to PROTECT OBAMA'S dereliction of duty, making up for its earlier revealing of information about Steven's personal concerns. It is a marvel and a concern that those who "guard and watch over America" had no clue that a terrorist attack was planned against our Ambassador to Libya and the whole USA compound! Actually, the most basic common sense would deduct that it was not prudent to put any representative Americans in a country that just suffered violent revolution and was infested with terrorists. What the heck were they doing there under those conditions and in that climate. Hey, they were sitting ducks–and no one in Washington snapped to that fact? Is this the way USA is being protected? If we didn't send an ambassador we would have offended Muslim sensibilities. If we brought Marines in to guard the compound it would have offended Muslim sensibilities. If we hadn't apologized for the sins of our past to kings and dictators it would have offended Muslim sensibilities. Even now Obama grovels before the UN blaming a short film but not his own policies. I am surprised he hasn't blamed those tea party terrorists yet. It seems Dems and Obama have more hate for them than those who slaughter our people. I agree with a caveat. The "boot" and integral intelligence link here is...our dead ambassador. He was, undoubtedly, in charge. Primary responsibility for the failures of intelligence and security there lie at his feet. What's the problem. Obama said Muslims are not terrorists. His policy is that if we're nice them and send them a lot of money they will be nice to us. What happened? Could it be that Obama is on the wrong side? Could it be that you have a pea-brain and watch Fox News! In addressing his wealthy donors about the 47%, Mitt Romney said "my job is not to worry about them because they're going to vote for the President." Well, Ambassador Stevens was also a Democrat! Would Romney have "worried" about Ambassador Stevens if he was President? I doubt it! What the he11 are you talking about? Blah Blah Blah your name says it all. Romney was talking about his campaign strategy NOT whether he was concerned economically about the "47%". He was in a room full of donors and was responding about how he would reach undecided voters. He was just stating the obvious that there were many voters he could not reach no matter what his message as they were committed to Obama already and that he had to concentrate on those he could reach. Nothing sinister here no matter how much you wish to spin it. Low security in a country that just came out of a Civil War a year ago, a recipe for disaster. I think the government can careless for our people in those areas. They just let it happen so they can make their points/cases to the world. We have enough knowledge, technology to set up boobies trap to protect and take out those intruders when they become a threat. One question that I find very troubling and no one is yet to ask is why didn't Ambassador Stevens and the other Americans try to ease tension by waving a white flag and trying to negotiate their way out of the crisis. After all, that is what Ambassodors do, they negotiate and compromise and when their backs are against the wall, they bring out the best negotiating skills. Furthermore, even if they had been captured and kidnapped, I believe that failure to negotiate with the insurgents negated any chances of a future rescue by our Navy SEALS. I just don't understand why they ddidn't try to negotiate their way out instead of panacking and allowing themselves to be overcome by smoke innihilation. Very sad and confusing. First, These people who are attacking are not fightting under any rules of engagement. The are outside the Geneva convention. Second, from everything I have read the attackers were not in any kind of position to negotiate. They had a target and an agenda. Negotiationg does not appear to be part of that agenda. Third, generally speaking, while there is even an iota of hope, Americans do not surrender. i will assume this a poor attempt at sarcasm. that is all. Republicans want to claim the pro-troop mantle. They never pass up a photo app with our Vets. But when it comes to actually supporting our troops, they're an abject failure. They send our troops into harms way without the proper equipment and body armor as was the case in Iraq and Afghanistan. They often send our troops off to war without clearly defining the mission and the end game. But when our troops return home, Republicans can't forget about them fast enough. For example, in 2010, John Boehner and House Republicans voted to cut the Veterans Bill but eventually pulled back on their proposal only because Democrats threatened to go public with the proposed cuts. However, in their plan to reduce the federal budget deficit, House Republicans eliminated $75 million in funding to help thousands of America's homeless Veterans. That is sad because according to the Department of Veterans Affairs, in 2009 roughly 136,000 Veterans were homeless. Furthermore, the decision by House Republicans to eliminate important funding for Americans who served in our Armed Forces especially during their times of need just to give more tax breaks to the rich is heartwrenching and appalling to say the least. They said it was a Consulate the day and weeks after the attack. Now the truth comes out and they are calling it what it is.. a diplomatic post . Very little security. The story continues to change. I heard on a radio news station that the Embassador was actually dragged half naked through the streets. I just don't have any confidence in the State Department anymore for lying to the public concerning this. How much more are we in the dark about? The television news stations are also not providing adequate information, it appears very one sided. All, understand that the two party system has not existed since we went to the "Fiat dollar" in 1971. We are living in a goverment sponsored Ponzi scheme that has been perpetuated by every president since it's induction. You doubt it? How do you explain the continous printing of dollars at every increasing rates? or the selling of US gold to control the price of gold? or why the interest rates have been held so low since the Bush administration? So blame every president from every previous term, but the real blame falls on us the people for failing the United States of America by following our leaders blindly and not questioning, educating and acting. Truth, for the most part. Stevens requested that security be reviewed as he feared for his life. Two weeks before the attack an aid to Clinton was visiting Stevens when she asked him about the lack of security. Stevens told her that he had requested a review from Washington, but the review was not granted. This could have been averted. Just because a loophole says that the condo didn't need to be heavily guarded doesn't eliminate the risk in a region that is full of extremists. Washington failed Stevens, and most importantly Hillary Clinton failed Stevens. It was her responsibility to protect Stevens and she did nothing to help him. His family deserves an enormous settlement from the government. He served his country, but his country left him to die. Agreed! I am convinced that no matter who we are and how we serve, our own country is capable of throwing us under the bus..... I mean really? HE WAS AN AMERICAN DIPLOMAT! An apology is more than in order! Do you doubt he was an agent provocateur, prior and during the overthrow of Ghaddifi? That he was, in theory and statement from State dept, the most knowledgeable of the ongoing situation in Benghazi/Libya? That he PUT himself in that house, at that time? That he was in charge during that incident? We don't need to put people like that on a pedestal. We DO need to assign blame for these failures...and not blame the "other" side when obviously failings on our part led to this conclusion. Just saw the Anderson Cooper report about CNN's handling of Ambassador Stevens' journal. It looks like CNN used information in the journal to seek out additional details about what actually happened. The WH apparently didn't like reports that are not compatible with their official story. It's now have to believe that the WH was not lying from the start to cover itself. "Hard to believe" is an understatement! They lied because: a) Romney criticized the feckless statement that was posted on the Cairo Embassy website on the 11th; b) the attack on the Consulate in Benghazi was proof of an utter lack of security around the Consulate, and the Ambassador; 3) they did not want it to become public knowledge that a private British security firm [Blue Mountain Group] was providing the security for all our diplomatic facilities in Libya, NOT Marines; AND 4) the planned terrorist attack on the consulate in Benghazi was just one more consistent bit of proof that the Obama foreign policy in the Middle East is in shambles. I didn't think Libya had a King, but the pic above obviously shows a queen. Why don't CNN follow up with the Gamers who were online with Sean Smith at the time of the attack? He clearly stated in Jabber (online messaging service) that a Lybian policeman was taking pictures 2 hours before the attack. 'I hope I don't die tonight. One of the Lybian policemen guarding us is taking pictures of the building. ; His conversations said nothing about a protest. Where did you hear that story regarding Jabber? Jason, here is the Yahoo story about Sean Smith, who was indeed online with gamers that night. Another story indicated that Smith's final message sent before contact was broken off was simply a one word response - "Gunfire!" Yes.....why don't they? Why aren't we hearing much about it? Anyone? Cui bono? And who smirked? Perhaps the President should have followed Mitt Romney's lead..."it's not worth moving heaven and earth to find Bin Laden." Or GWB's lead..."I'm not worried about Bin Laden at all." How come the previously administration always gets free pass from you guys??? Who dropped the ball on the going after al-Qaeda. You heard Bush said when asked about where Osama bin Laden was "I don't know don't care, not worried about him." Just maybe if he had been more worried about it, we'd be much further along in combating al-Qaeda. But who has carried the fiight, who has killed more al-Qaeda, how about giving credit where credit is due. please don't change the subject. bush failed in a lot of ways but those failures are for another discussion. THIS terrorist attack was entirely on THIS administration's watch. I guess the crystal bal was in the shop. The nature of this attack made it unlikely to have been predicted. There aren't enough assets to harden all of our diplomatic facilities enough to withstand such an attack. bob – you're right. there was no way to predict this attack. oh, wait. "American diplomats were warned of possible violent unrest in Benghazi three days before the killings of US Ambassador Christopher Stevens and three members of his team, Libyan security officials say." "The U.S. State Dept. issued a travel warning telling Americans to avoid Libya two weeks before the deadly attack that killed Ambassador Christopher Stevens and three others. 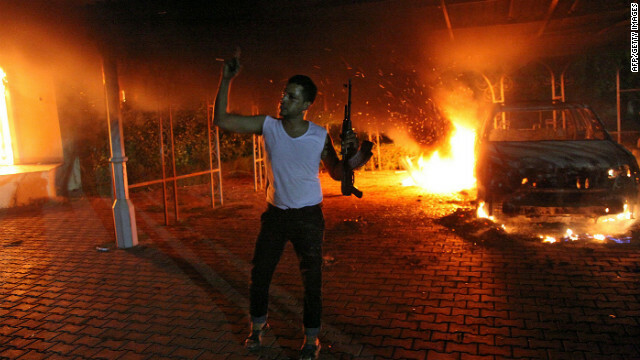 In addition, a recently updated threat assessment for Libya demonstrates the State Department was aware the security situation in Benghazi had become particularly dangerous for diplomats. Despite this, security at the US consulate appears to have been minimal during Ambassador Stevens' visit." "The Department of State warns U.S. citizens against all but essential travel to Libya," reads the new travel warning issued today [August 27, 2012]. "The incidence of violent crime, especially carjacking and robbery, has become a serious problem. In addition, political violence in the form of assassinations and vehicle bombs has increased in both Benghazi and Tripoli." There have been over two hundred militant attacks on our most heavily fortified bases in Afghanistan and Iraq over the years with alot of American and NATO casualties. So what makes you think that a dozen or even two dozen marines would have averted an attack on our consulate? These militants used rocket propelled grenades from a distance as is usually the case in Afghanistan and Iraq. The only defense against these militants or insurgents is to bring our troop s home and keep them home. blah blah – um, how about NOT HAVE HIM THERE AT ALL. that is, don't send the ambassador over there during such a knowingly hostile period. and if it's so vital that he be there on that day (which it wasn't), provide enough security to keep him safe - and give them the ammo to do it. Hello Shaggy, if it wasn't for Bush starting this take down of Bin Laden it would have never of happened.. This was well in effect before Bush left office, get your facts straight..
Yea, Bush did start taking down Bin Laden all right. It all started when OBL was cornered in Tora Bora in 2002. As the U.S. forces closed in for the kill, GWB called General Tommy Franks and told him to withdraw our forces and let the Mugahardeen take the lead because in GWB's words, 'the terrain too tough and the mission too risky. So just imagine GWB withdraws the world's most advanced and equipped forces from the mission to let some opium growing farmers take charge of such an extremely important mission, wavering to the terrorist and giving OBL his escape and safe heaven in Pakistan. They say everything in Texas is big but perhaps GWB shouldn't have built such a big and revealing house for OBL in Pakistan. After all, his mission to harbor and protect OBL may have been mission accomplished had the house been smaller and less revealing. thank you, CNN, for finally reporting what was self-evident when this tragic event occurred on sept 11. the insulting false narrative concocted by this administration and fostered by the MSM hasn't fooled anyone. this is not something we as Americans will allow to be swept aside. this was a terrorist attack on American soil that left 4 Americans dead. this was a gross dereliction of duty by the state department and the obama administration and secretary clinton, if she had any conscience at all, should absolutely resign. nonetheless, the truth always comes out in the end and justice will prevail, both at home and abroad. so let me get this straight: truth = whining. got it. GenXer – Absolutely agree with your posts! Hillary Clinton should immediately resign in disgrace, or she should be fired. And Barack Obama should be voted out of office in November. Let us focus on the causes of terrorism and try to fix the issues. They have been hanging out there for over 60+ years ...in India....in Israel..and now in the United States...England...Austrailia...Sweeden....all over the Europe. Let us focus on the victims of 9/11 and help the families more than we have done. Let us take care of their kids and put them through college. Let us take care of their wives/husbands/parents. Let us take care of families whose dear ones gave their lives in fighting al Qaeda terrorists...in Pakistan...in Afghanistan....in Iraq....in Yemen....in Africas. Let us focus on the victims of Pakistani sponsored terror networks....Haqqani...Pakistani Taliban...Hazbollah in Iran...Hammaz in Palestine. Let us honor US/NATO soldiers from all over the world who sacrificed their lives believing they were fighting for freedom, believing they were fighting evil terrorists in Pakistan....in Afghanistan....in Iraq....in Libya...in Syria...in Yemen....in Egypt....in Africas. They are so many. Just in last ten years, terrorist sponsoring countries like Pakistan, Iran, Pelestine have change our lives once and for all. America is the bigest terrorist in the universe. Not Pakistan. Pakistani politicans thnk thy cnt go without ths America, so thy dnt fight America. We the victims of Swat operation in Pakistan found US dollars full bag with people who were fighting against us. Thank you CNN for reporting on the blatant cover-up of this administration about the murder and torture of our ambassador and others. The lack of security is inexcusable even after warnings were issued. Our taxpayer dollars are paying to protect the evil president of Iran, but has done nothing for our own in Benghazi and all the other consulates attacked. We are OUTRAGED. How outraged are you about the two wars started by the Bush Administration that have left thousands dead and disabled and trillions of dollars to pay for those useless wars that will continue to have a direct effect on millions of Americans lives in the future. HOW OUTRAGED ARE YOU ABOUT THAT MR. PATRIOT. Why is it that Obama supporters are prepared to blame everything on the past to avoid looking at real issues today – is Obama to be given a free pass on everything he does? This has nothing to do with political parties but about security decisions taken by this administration that cause 4 American deaths and probably the loss of a great deal of very sensitive intelligence. If past administrations must accept blame.... why not this one? Thank you CNN for doing your job & being responsible when the President and his administration refuses to do theirs – yet tries to attack CNN. Changing the topic won't do either of us any good. It's clear we won't all agree on the same things but can you at least take a good look at the truth in the comments posted? Our country does provide financial assistance to other countries for their (other countries) protection. Why not our very own. Wether Democratic or Republican....we are all still Americans. You mean the same war the Obama is still continuing in Afghanistan? The one that he still hasn't brought all the troops home yet. Yet another promise he didnt' keep. Were are all those people standing on the streets with signs yelling "Bring them home". Get out of your parent's basement and get a clue in life. The administration is a failure in every area and it's going to get worse if he is re-elected. The Ambassador's death may be a smoke screen. Two Navy Seals were killed in Libya and the press is ignoring that. How many coincidences does it take for people to see that the Obama administration has it out for our military (especially the Seals and CIA), patriotic citizens (Tea party members, Republicans, Libertarians, and even moderate Democrats), conservative Jews, Evangelical Christians, straight Caucasian males, and anyone else who is not blindly devoted to their radical vision of America? The Obama administration's new America hates traditional America–that is all that binds its followers together. Having only hatred to bind the many factions, their coalition of malcontents lacks any guiding moral principles and governs without conscience–accordingly, they will ultimately fail. There is nothing wrong with the U.S. being a traditionally Judeo-Christian country; it has served us well and it is who we are. WE HAVE THE RIGHT TO A HOMELAND. The U.S. is open to Muslims who can live in a traditional Judeo-Christian country; we are not intolerant of otherness. Muslims who cannot abide by our culture, however, have many Muslim countries they can call home. Accepting the intolerance of those harboring anti-American sentiments is where the Obama administration goes horribly wrong. Certainly there are good Muslims and bad Muslims, just like people in any group. However, those in the Obama administration appear to align with the extreme Muslims who are intolerant of Judeo-Christians–and would appear to communicate freely with them. Those in the Obama administration are not acting as private citizens, who are free to have any opinion; their official job is to represent America and not to aid and abet the enemy in strikes against Americans. Who in the Washington ordered the waiver for higher security? Start with that person and work up the chain of command. That act is tantamount to aiding and abetting murder, and in the context of national security–treason. No wonder the State Department confiscated any hard evidence. The will lie, deny, and obfuscate for decades to come. The Obama administration is way too cozy with Muslim extremists, much more than the media opening report, although some has come out. The Obama administration seems to work around the U.S. military and CIA not with them, and they seem to be using their contacts with Muslim extremists to "wag the dog". The Osama bin Laden kill was fake as he died in 2001. The Obama administration may have had a contact in the Abbottabad complex who actually killed the younger man identified as "Osama" (perhaps it was Hamza bin Laden) so that the Seals could not take him alive. Then it would seem that the Obama administration systematically went about setting up Seals for killing, some of whom may know secrets that threaten the narrative of the Obama campaign. How many Seals have died since 2001? Twenty-two plus two plus two: how statistically improbable is that? The public needs to know more about which missions the Seals who have died went on. President George Bush needs to release some long-held secrets if innocents are being killed and the American public is being horribly misled. Did President Bush order the killing of Osama bin Laden under his watch and kept that secret to protect the Seals who served on that mission? Now is the right time for the truth to come out. Correction: How many Seals have died since 2011 (May 2, 2011)? I agree with this post .Though Obama may be the guy to have a beer with I am now feeling he does not have what it takes to keep us safe. Citizens for Seals, nice and accurate post.... Bush needs to come forward and let ALL Americans know WHAT HE!! started before his term was up.. Really tired of this President we have...If the seals would have failed on getting Bin-Laden that day, then OBAMA would have blamed BUSH..
You're either smoking WMDs or drinling too much Kool-Aid. A few more sips ough to do the job you right wing moron. This is a smoke screen if there ever was one. I have worked at intel sites in European countries of our allies that had more protection than what's been described in Libya. This is a disgrace. If our State Department is not protecting our foreign Embassies in hostile countries, what faith do you have they are protecting any of the rest. If I were in the foreign service I would be very worried no matter my assignment because if the government doesn't protect it's ambassadors, what hope do the rest have in their security. The President is the Command-In-Chief and people are dying because he is not do all he can to protect them. Also, what does that say about the protection of the homeland? It's time for someone else, because what we have in office is not what this country needs. I was about to agree with most of your comment until you made it into a political pawn for MITT ROMNEY. Do you Republicans value anything. Guess what Dean, a lot of people feel,this way. Even those not Republican such as myself. I don't think this issue is an issue of political poles but rather who was wrong, who did not protect who has tried to spin this into something it wasn't, who failed their people. This is not about what party our CIC is in but who that man & who he chooses to represent him is – an abysmal failure. Look Dean. I am neither on one side or another but am trying to make a decision. The truth of the matter is that I want to feel protected in my country. Unfortunately, I am beginning to feel like a sitting duck. If our embassador being killed prompts an apology to the killers from our own president, what is next....another major attack on our country and another apology. None of us are safe anymore. So you really think that this article fully describes all the security measures that were in place?? I think not. And the last thing we need is another set of hawkish cowboys in the White House. We haven't come near undoing the damage done by the Bush/Cheney debacle. I'm not worried about our embassies. I'm more worried about the right wing domestic terrorist extremist christian brotherhood militant groups in this country and the likes of Ted Nugent and Judge Tom Head who are conspiring to undermine our democracy. It's apparent that you are not worried about out emassies...... you should be though. Ted u sing an reed minded with fork thing like jihads an Mideast I track u I no this is true DEA likes me to track u an jihads we can take an will take all your dope at your showe,s we mite drop water an bords as if Rogger Water is with my b his bord in need to go to AK. DON'T U YES RITES./////pnm.